Ready for the new Nexus phone announcements next week? Google is, and apparently they're preparing for a launch soon after that. A device that's without a doubt the LG Nexus 5X has arrived at the Federal Communications Commission for documentation and certification, an essential step in selling any wireless device in the United States (and a frequent source for gadget leaks to hungry nerds). This particular phone uses the model number LG-H790, presumably the carrier-agnostic version for the United States, while the international version leaked by an Amazon India listing yesterday is the LG-H791. The LG-H791 has also been listed in the FCC database. The H791 model uses most of the same bands, but removes support for LTE band 12, 13, and 25. At first glance, that seems to leave a lot of holes compared to the Nexus 6, specifically for T-Mobile's current 3G data system. But a lot of GSM, CDMA, and LTE systems use the same frequencies for different bands on the various standards. It's possible that the radio in the phone is capable of the same kind of cross-carrier compatibility that we saw in the Nexus 6, even without the FCC specifically mentioning that in its standard report. After all, it would hardly make sense for Google to release new Nexus phones that weren't compatible with its Fi network, which uses both Sprint and T-Mobile radio frequencies as an MVNO. According to the site that originally spotted the new FCC listing, Sprint 4G Rollout Updates, the radio will be compatible with AT&T, Verizon, T-Mobile, and Sprint networks. We're inclined to agree. While we don't have an explanation for the reported band discrepancy between last year's Nexus phone and this one, we're 100% confident that Google wouldn't go backwards in terms of broad carrier support for the US. Also, we now have a second source for the Nexus 5X dimensions beyond the Amazon leak (which we suspected to be erroneous). The LG phone will reportedly be 146.9mm tall by 72.5mm wide, which is both taller and wider than the original Nexus 5 - not surprising, since the reported screen size is 5.2 diagonal inches. The FCC says that the display size is 133mm diagonally, or exactly 5.23622 inches, so that seems to check out as well. The battery is non-removable. Unfortunately, we don't have any photos of the device itself from the FCC. There are good reasons for that: since the FCC no longer requires device manufacturers to place FCC confirmation labels on the phone's exterior, there's no need to include said photos in the database. Plus, the Request for Confidentiality letter, which is customary for hardware tested by the FCC, specifically asks for said confidentiality on all internal and external photos, and then some. 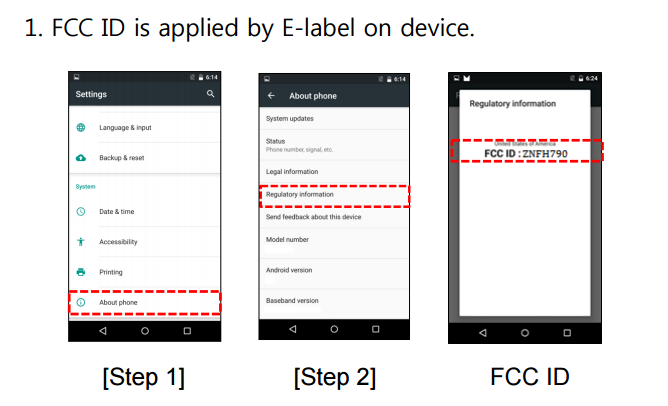 Instead, we get some screenshots of where you'll see the FCC ID label within the Android Settings menu. One last tidbit: the SAR evaluation report for the LG-H791 (the international version) briefly mentions "Handset Wireless Chargers Battery Covers," but the same line is left out of the document for the US version of the phone. So, the Nexus 5X may or may not have wireless charging, and that might change between the two models. Google has scheduled the announcement of the Nexus 5X and 6P for September 29th, next Tuesday. Until then, you'll just have to tide yourself over with our numerous Nexus leaks.